Palestinian Christians living in the Gaza Strip are being denied access to Jerusalem by Israel during the Holy Week and the Easter weekend, although worship at the Church of the Holy Sepulcher, in Jerusalem’s Old City, deemed the most sacred ground in Christianity, carries special significance during the Easter period. Christian pilgrims from across the globe visit the Church at Easter, where they believe that Jesus was crucified, buried and rose from the dead. 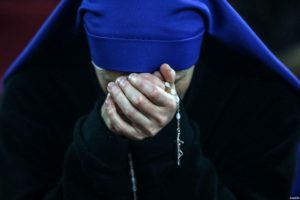 However, Palestinian Christians from Gaza are yet to receive any travel permits from Israel, church leaders have complained, reported the middleeastmonitor.com. Christianity Today reported that the Latin Patriarchate of Jerusalem said church authorities had applied for around 600 travel permits for Gaza Palestinian worshippers, but had not received any. On previous occasions, Israel issued permits to Palestinian Christians over the age of 55 but even this does not seem to be the case this year. The report raises further concerns about the severity of the Israeli-led siege imposed on Gaza, which is now entering its eleventh year. Church leaders are said to be fearing more restrictions than usual this year as Easter falls on the same weekend as the start of the Jewish festival of Passover. Some also fear that Israel has been emboldened by the recent unilateral and controversial decision by Donald Trump to recognize Jerusalem as the state’s capital. Written by: Jaber Ali on March 28, 2018. Posted by Jaber Ali on Mar 28 2018. Filed under Headlines, World News. You can follow any responses to this entry through the RSS 2.0. Both comments and pings are currently closed.